Volunteers on a Physiotherapy placement in Costa Rica work at a school for mentally and physically disabled young people or at a day centre for the elderly. These placements will give you the opportunity to shadow and support trained physiotherapists as they work to improve the quality of life for children, young people and the elderly in their community. As well as helping to make a difference to people’s lives, the experience and skills you gain will be a fantastic addition to your CV. The disabled school is the only centre of its kind in the province and provides care, education and therapy for young people (up to the ages of 21) and for babies who suffer from diverse cognitive and behavioural disabilities. These children and young adults receive one-on-one attention in the treatment room or in the classroom to help them develop their motor skills and improve their quality of life. Government centres are often under-staffed and under-funded, and the staff appreciate help from our volunteers. Volunteers also have the option of working at a day centre for the elderly, which is run by a local association that offers physiotherapy to all its members. The centre’s qualified physiotherapist regularly treats and monitors up to 35 patients. 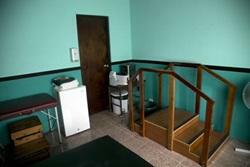 You will assist in the treatment room and help the patients with their exercises. Although each patient has different needs, the main aim is to improve their motor skills and increase muscle strength to help maintain their independence and quality of life. If you have a preference regarding which placement you would like to work at, please let us know on your application. There is also the possibility of combining both placements to broaden your experience. Volunteers working with vulnerable groups, such as people with disabilities and the elderly, will need to show a lot of patience and compassion, and should be willing to help out wherever possible. You will find this a challenging, but very rewarding experience. Working hours run from about 7am to 3pm at the disabled school, and from approximately 8am to 1pm at the centre for the elderly. You will need to speak at least basic to intermediate Spanish and have completed a minimum of one year physiotherapy training to join this programme. The disabled school welcomes volunteers with additional experience in other types of therapy, such as art therapy or occupational therapy, so if you have skills in these areas please let us know. Please note that the disabled school is closed for holidays from mid-December to mid-February, with a shorter holiday in the first two weeks of July. They also close for one week over Easter. The centre for the elderly also closes during Easter and for approximately three weeks over Christmas. All volunteers taking part on any project in Costa Rica now have the opportunity to add a 1 Week Conservation Add-On to the end of their main placement.